Tomorrow (February 24 @ 7 pm) is the opening of the Jamaica Biennial 2017 at National Gallery West in Montego Bay, where David Gumbs’ Xing Wang project is featured. Here is a preview. David Gumbs (1977, St Martin) studied at the Visual Arts School in Fort-de-France, Martinique, in 2001 and majored in interactive multimedia conception at Les Ateliers, L’ENSCI in Paris in 2002. His work has been shown nationally and internationally, including recently: Digital (2016), National Gallery of Jamaica; Video Islands (2015), Anthology Film Archives, New York; Transforming Spaces (2014), National Art Gallery of the Bahamas; Trinidad and Tobago Film Festival (2014); and the Martinique Biennial (2013), Fort-de-France. 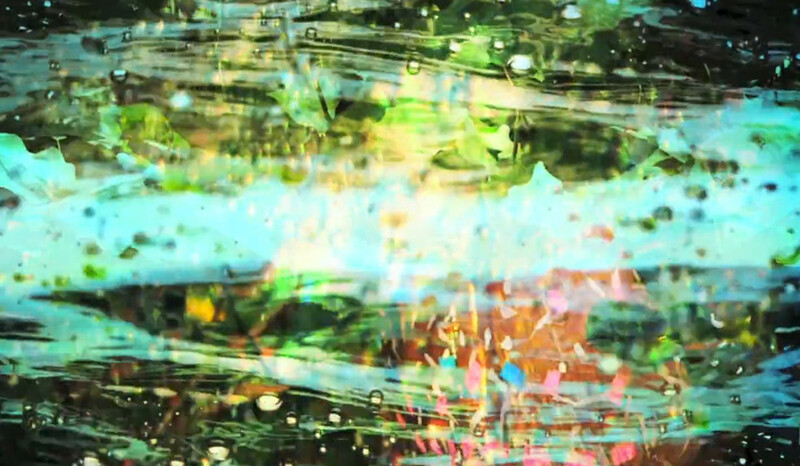 Since 2009, Gumbs teaches multimedia, transmedia and motion design at the Visual Arts School in Fort-de-France, Martinique. 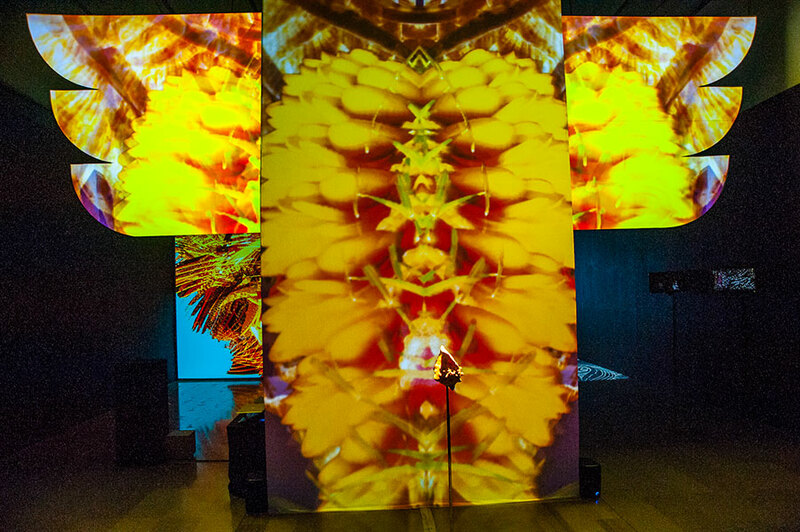 He “explores the unseen, the cycle of life, the nature within, and digital rhizome macroscopic universes, across a dynamic multimedia oeuvre, including painting, photography and experimental video.” Gumbs in 2016 participated in a Davidoff Initiative residency in Beijing, China, and his contribution to the Jamaica Biennial 2017 consists of an interactive video project titled Xing Wang (Blossoms), which he developed during that residence. The Jamaica Biennial 2017, the National Gallery of Jamaica’s flagship exhibition, is shown at three locations, namely at the National Gallery and Devon House in Kingston and at National Gallery West in Montego Bay. At National Gallery West, which is located at the Montego Bay Cultural Centre, Sam Sharpe Square, the Biennial will feature an interactive video installation by the Martinique-based David Gumbs. This exhibition will open to the public on Friday, February 24 at 7 pm. The guest speaker will be His Worship Homer Davis, the Mayor of Montego Bay, and the artist David Gumbs will be in attendance. 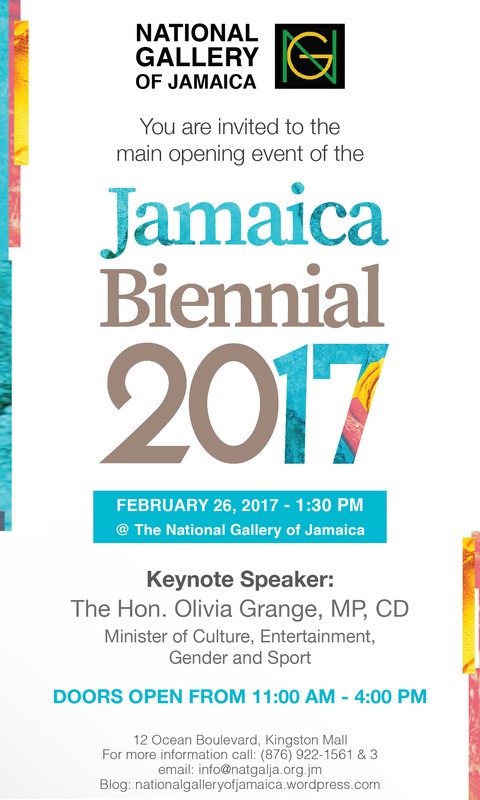 The main opening function of the Jamaica Biennial 2017 exhibition will take place at the National Gallery of Jamaica on the Kingston Waterfront on Sunday, February 26, starting at 1:30 pm. The keynote speaker will be the Hon. Olivia Grange, MP, Minister of Culture, Entertainment, Gender and Sport, and there will be several live performances by participating artists. Deejay Iset Sankofa will spin music. With more than 160 works of art by more than 90 artists shown at three different locations—the National Gallery and Devon House in Kingston and National Gallery West in Montego Bay, the Jamaica Biennial 2017 is the largest such exhibition in the National Gallery’s history. It provides a dynamic and diverse overview of current art from Jamaica, elsewhere in the Caribbean and the Diaspora in all artistic media, including painting, sculpture, ceramics, textile and fibre art, photography, installation and new media. The exhibition has four components: special projects by international invitees; tribute exhibitions to two noted Jamaican artists; contributions by the artists who have invited status; and what was selected from the juried submissions—the latter two sections include artists who are born or based in Jamaica and artists of Jamaican descent who live elsewhere. The resulting Jamaica Biennial 2017 offers a healthy and at times provocative mix of new, emerging and established artists, including recent graduates of the Edna Manley College such as Ziggie Graver and Kelley-Ann Lindo; artists who have never exhibited before such as Nathan Cunningham, who is self-taught; and as well as well-known artists such as Samere Tansley, Marlon James, Laura Facey, David Boxer, Deborah Anzinger, Prudence Lovell, Storm Saulter, Phillip Thomas, Bryan McFarlane, Petrona Morrison, Shoshanna Weinberger, Jasmine Thomas-Girvan and many others. The special projects are by Andrea Chung, David Gumbs, Nadia Huggins, Jodie Lyn-Kee-Chow, Raquel Paiewonsky, and Marcel Pinas—all of them artists with Caribbean roots or based in the Caribbean—while the two tribute exhibitions provide overviews of the work of Alexander Cooper and the late Peter Dean Rickards. 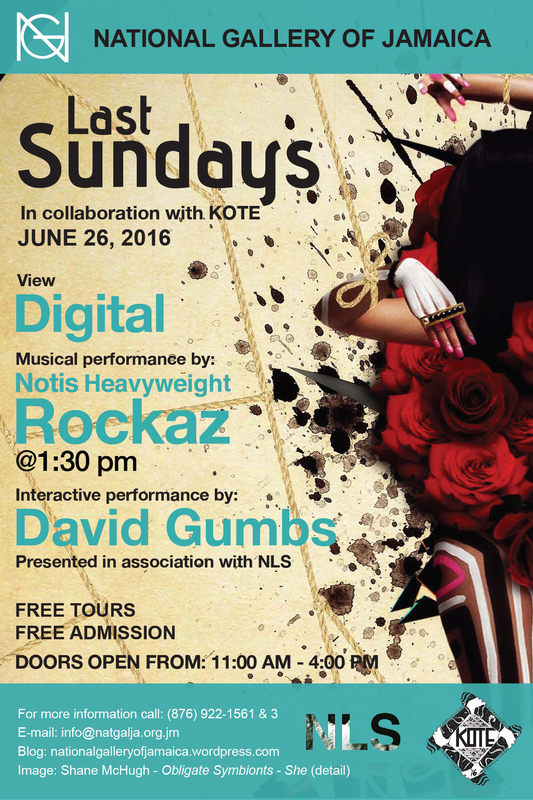 The National Gallery of Jamaica is presenting a special edition of its Last Sundays on June 26, 2016, on the occasion of the 2016 Kingston on the Edge (KOTE) urban arts festival. The programme features music by Notis Heavyweight Rockaz and, in collaboration with New Local Space (NLS), there will be an interactive video performance by the Martinique-based artist David Gumbs. There will also be opportunity to tour the current exhibition, Digital, and to view the permanent exhibitions. David Gumbs was born in Guadeloupe in 1977. A multimedia artist, painter, photographer, and experimental video artist, he studied Interactive Multimedia Conception at Les Ateliers, L’ENSCI in Paris 2002, following his graduation from the Visual Arts school in Fort-de-France Martinique in 2001. 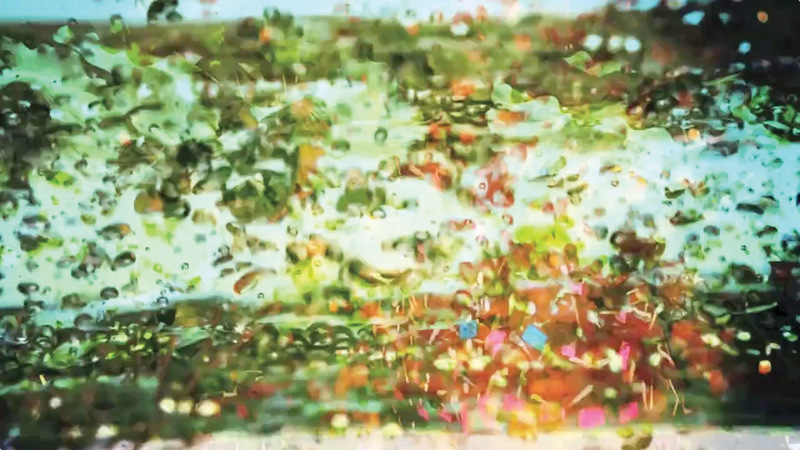 His solo exhibitions include Hors-champ at 14°N61°W in Martinique and Somewhere in Paradise in Haïti, both in 2013, as well as Géographies Inconscientes at the Tropiques Atrium in Martinique. His most recent group show participation includes the Trinidad and Tobago Film Festival (2014) and Reflexions (2014) at the 14°N61°W contemporary art space in Martinique. Gumbs has participated in a number of artist residencies and his work has been featured in publications such as Frieze and ARC Magazine. He is currently participating in an art residency in China, sponsored by the Davidoff Art Initiative. To disappear into deep water or to disappear toward a far horizon, to become part of depth of infinity, such is the destiny of man that finds its image in the destiny of water.